12 Strong is scheduled for American release on January 19. They became known as the Horse Soldiers – the first 12 American troops to enter Afghanistan to fight the Taliban and Al Qaeda following the 2001 terror attacks on US soil. The trailer for 12 Strong, the movie that tells their story, has now been released. The film is being billed as the declassified true story of the Horse Soldiers. The movie, due for US release on January 19, is set in the days following the 9/11 attacks. A US Special Forces team, led by their new captain Mitch Nelson (played by Chris Hemsworth), is chosen to be the first US troops sent into Afghanistan for a dangerous mission. There, in the rugged mountains, they must convince Northern Alliance General Dostum, played by Navid Negahban, to join forces with them to fight their common adversary, the Taliban and their Al Qaeda allies. In addition to overcoming mutual distrust and a vast cultural divide, the Americans — accustomed to state-of-the-art warfare — must adopt the rudimentary tactics of the Afghani horse soldiers. The new allies face overwhelming odds, outnumbered and outgunned by a ruthless enemy that does not take prisoners. The Green Berets were left with no option but to saddle up to cover the treacherous terrain and take on their adversaries, literally waging war on horseback. The film is directed by Nicolai Fuglsig and based on the acclaimed book Horse Soldiers by best-selling author Doug Stanton. 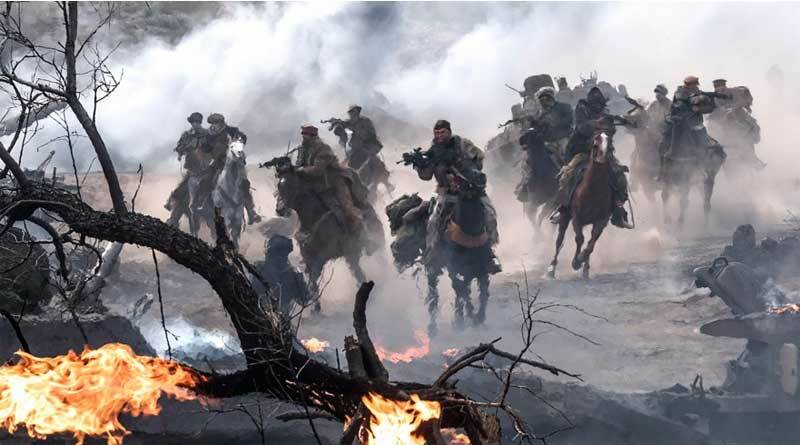 12 Strong also stars Michael Peña, Navid Negahban, Trevante Rhodes, Geoff Stults, Thad Luckinbill, Austin Stowell, Ben O’Toole, Austin Hebert, Kenneth Miller, Kenny Sheard, Jack Kesy, Laith Nakli, Fahim Fazli, Yousuf Azami, Said Taghmaoui, Elsa Pataky, William Fichtner, and Rob Riggle. The Green Berets joined Northern Alliance fighters on horseback to take on the Taliban in Afghanistan.